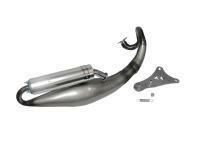 Performance quad exhaust for 50cc / 70cc Daelim S-Five and E-Five models from Spanish exhaust specialists Turbo Kit. The quality silencer both looks great and produces a perfect sound. The main focus of Turbo Kit however, is on the best possible engine performance. For this reason, the systems are only offered as a complete system and offer perfect performance enhancement for 50cc cylinders. Comes with all the necessary hardware included. Without E-certification . Exhaust system fits on Daelim S-Five and E-Five.